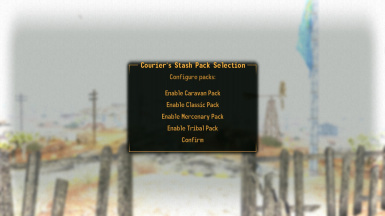 A simple mod that allows you to pick and choose which pre-order packs you want to receive. Configurable to wait until you are outdoors, wait until you are in the Mojave Wasteland (mainly for use with TTW or New California), or to wait until you tell it to open. 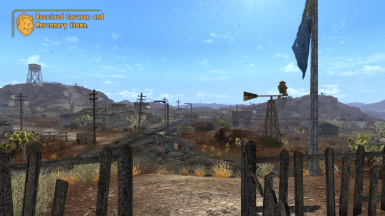 Can be configured to wait until you are outdoors, wait until you are in the Mojave Wasteland (mainly for use with TTW or New California), or to wait until you tell it to open. Once you've configured it to your liking, you can set it to not be shown in the MCM anymore or leave it be. Once you've selected which packs you want to receive, you will only receive one message confirming the selected packs. No more 20-message spam about items being added to your inventory. It is recommended to load this late in your load order, as the only changes it makes to other items is disabling what originally gives you the item packs. Doing otherwise may result in duplicate items.